I’m delighted to say that my guest today is another Romaphile. 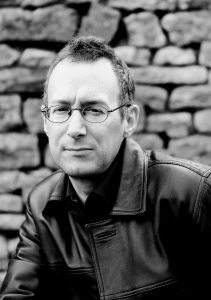 Ian Ross, author of the Twilight of Empire series, was born in England, and studied painting before turning to writing fiction. After a year in Italy teaching English and exploring the ruins of the Roman empire, he returned to the UK with growing fascination for the period known as late antiquity. He now lives in Bath and has been researching and writing about the later Roman world and its army for over a decade. The good news is that Australian readers can now obtain Ian’s books here. 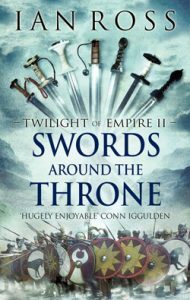 To celebrate the release of The Battle for Rome, Ian is offering a free set of his Twilight of Empire series: War at the Edge of the World, Swords Around the Throne and The Battle for Rome. Leave a comment to enter into the draw. Remember to leave contact details. Offer open to Australian residents only. Entries close at midnight 31 March 2016 AEDT. The winner will be drawn via random.org. You can learn more about Ian and his books on his website, and he would love to connect with you via Facebook and Twitter. Take a look at his Journal for fascinating facts and observations on Roman life. All of Ian’s books are available through Harper Collins Australia. I’ve written stories for as long as I can remember. It never seemed an unusual thing to be doing! I suppose it wasn’t until my late teens that I realised you could make a living from it, and since then I’ve never wanted to do anything else. 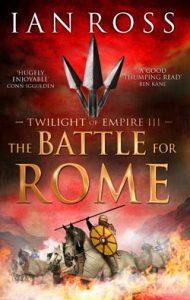 My new book, Battle for Rome, is the third in a series called ‘Twilight of Empire’, set in the early fourth century AD, a revolutionary time for the Roman world. I’ve always been drawn to ancient history, and I think the inspiration comes mainly from the very dramatic events of that particular era. But there’s also a lot more left of the later Roman world: if you go to Rome, or any Roman site, most of the ruins you can see date from that time. It still feels quite present, in a way that earlier eras perhaps do not. I always try and have a set of themes for each of the books I write. Some are more obvious: the boundaries between civilisation and barbarity, or freedom and slavery, for example. This book mostly covers a military campaign, based very closely on the surviving historical sources, but I’m always most concerned with the characters I’m writing about. My hero, Aurelius Castus, gets promoted to command a legion at the start of the story. So there are themes of loyalty and treachery, the burdens of command and effects of fear. There’s also a lot about the position of women in this very male-dominated society. I’ve always found the Roman era most compelling, for its scale and complexity, the duration and extent of the empire – and the sense that this was a world similar to our own in many ways but radically different in others, and totally lost to us now – although I can easily become enthralled by just about any past era! I research everything I write as deeply as possible – luckily, I enjoy all the reading! For the era I’m covering, there are quite a few surviving literary sources, although many of them are extremely biased, and focus almost entirely on the activities of the Emperor Constantine. Beyond that, there’s a vast wealth of secondary history on the social and military details of the era. I’ve been studying this stuff for well over a decade, and there’s still plenty more to discover. I always try to visit the places I’m writing about as well, which is a particular perk of the job. I think when I started the first book I was consciously reaching back to authors I’d enjoyed when I was much younger – Rosemary Sutcliff’s work, and C.S. Forester’s Hornblower novels. Also a fantasy writer called Gene Wolfe, who I liked a lot in my later teens. But I read very widely, and pretty voraciously, and I’ve usually got three or four novels on the go at a time, so all sorts of influences get in there, no doubt! I’m seldom stuck, actually. I write very quickly, in short concentrated bursts, and think out a lot in my head before I start putting the words down, so when I’m working well it often feels like I’ve done all the composition work before I get started. I’m held up more often on the bigger stuff, the structural things and the framing of particular scenes. In those cases, when I know that no amount of bashing away’s going to help anything, I try and take a break from it and go for a long walk instead. There are a few steep hills and some woods near my house, and a hike around there usually clears things up. I have a very visual imagination, I think – I started out as an art student, many years ago – and I always like to be able to picture what I’m writing about. Luckily, there’s plenty of artwork surviving from the period I’m working on, particularly mosaics and wall paintings, that give us a very clear idea of what that society looked like. 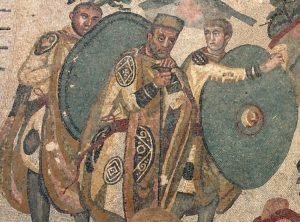 My favourites are the fabulous mosaics from the Roman villa at Piazza Armerina in Sicily, which date from around AD320, very close to the period I’m writing about. They show scenes of everyday life, soldiers and hunters, noblemen and ladies, slaves and dancers and religious rituals, ships and animals. Really bold vigorous pictures, and all in colour too, like a giant strip cartoon. Some of the faces have a real sense of character and individuality too. Things like that can give you a very clear impression of this complex world of the distant past, and propel the imagination. Only write about things that genuinely interest and excite you. Putting a novel together’s a long and difficult process, but if you enjoy what you’re writing then others are more likely to enjoy reading it. And stick at it – don’t assume that the first thing you write is the best thing you can write. You sort of learn on the job, I think, and the further you go the better you get. 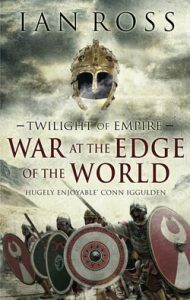 I’ve just completed the fourth book in the ‘Twilight of Empire’ series, the follow-up to Battle for Rome. It continues the story of Aurelius Castus and his adventures in the late Roman world, as he climbs even further up the precarious ladder of command. Needless to say, he’s quickly thrown into some desperate situations and finds himself fighting for his life. I’ll say no more about it now – it should be published later this year! The Roman Empire is on the brink of civil war. Only Maxentius, tyrant of Rome, stands between the emperor Constantine and supreme power in the west. Aurelius Castus, promoted from the ranks for valour and loyalty, is now a tribune in Constantine’s army. But great honour brings new challenges: Castus is tormented by suspicions that his aristocratic wife, the mother of his child, has been unfaithful. And as Constantine becomes increasingly devoted to Christianity, Castus is forced to ask himself whether he is backing the wrong man. All know that the coming war will decide the fate of empire. But Castus’s own battle will carry him much further – into the shadowy realms of treachery at the heart of Rome itself. The third book in the brilliant Twilight of Empire. All of Ian’s books are available through Harper Collins Australia or via his website. Don’t forget to leave a comment for the chance to win a set of the Twilight of Empire series! Remember to leave contact details. Offer open to Australian residents only. Entries close at midnight 30 March 2016 AEDT. Winner will be drawn via random.org. Thank you for introducing Ian and his work to me. Ancient Rome does fascinate. I imagine that the research would have uncovered some very interesting data. Thanks for dropping by, Mary. What’s always wonderful is that archaeologists continue to discover more and more which makes an author’s job of research both a challenge and a delight. Hi Lisa. Thanks for featuring a writer whose novels are set in the later Roman period, an era I think that is often overlooked by fiction writers in favour of other periods. I’ve read some of Ian Ross’ books, and I’ve been impressed by his close attention to primary sources. Chris, being an early Republican myself I’m always fascinated to learn about different eras of Roman expansion. Ian and I write at different ends of the spectrum – the nascent and the decaying sides of Rome. Thanks for dropping by.